What do an art student, a suburban family of four, a retired couple from Portugal, and an inner-city second grader have in common? They all visit the Franklin Institute. In a normal year more than 800,000 visitors come to the museum, every single one of them for a different reason. The art student may come to do research for a project, the family to spend some quality time together, the Portuguese couple to experience an American cultural center, and the second grader for a field trip. Each of them has a different motive and wildly different interests. When visiting the Franklin Institute, most visitors think of the Giant Heart or the Baldwin 60,000 Locomotive, and while exhibits like these do an incredible job of creating immersive and engaging experiences, they simply can’t be everything for everybody. To create a truly personalized, world-class experience, you need a person. That is where our heroes swoop in -- not wearing capes, but more subtle costumes of grey polo shirts. 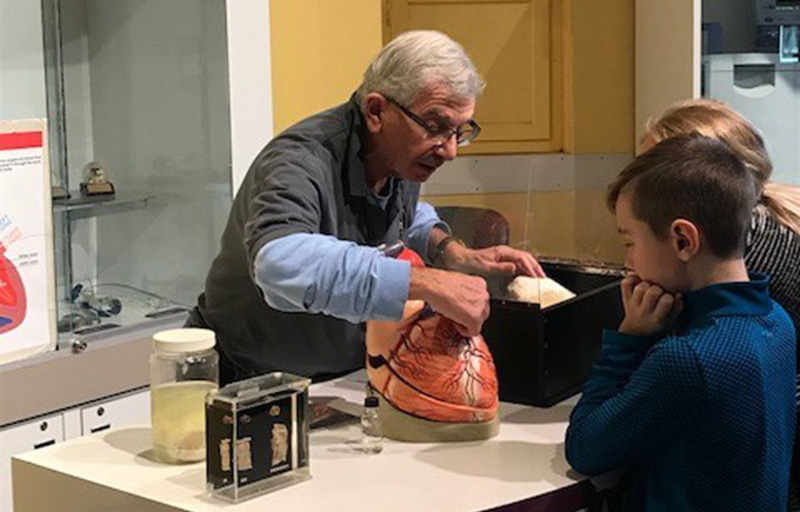 The Franklin Institute is home to more than 400 year-round volunteers that support many aspects of its operation, and more than half of them are on the front lines as Science Presenters and Exhibit Facilitators. They are high school students, working scientists, retired engineers and educators, all united by common passions for science and people. Ask Questions to spark curiosity, motivate learning, and create a learner-driven experience. Inspire Scientific Thinking by encouraging visitors to make hypotheses, take risks, value processes over products, and learn from failure, just like real scientists. Make Connections to visitor’s lives, helping science take on personal meaning for guests, and helping them to feel like scientists. Cultivate Rich Dialogue between and with visitors, using science vocabulary in relevant contexts to aid understanding, encouraging visitors to communicate their own thoughts and ideas, and to work together to investigate phenomena. That art student doing research for an installation on the neuroscience of epilepsy encounters a volunteer in the Your Brain exhibit who directs her to the most relevant exhibit components, and offers to put her in touch with one of the museum’s chief scientists to help her find just the information she needs for her project. The suburban family meets volunteers in the Observatory, and gains the shared experience of looking through the lens of our 12-foot Zeiss telescope. The older child tells one volunteer all about her favorite sci-fi novel and discusses the formation of black holes, while the younger child and the father talk with another volunteer about why the sun sets every day. The Portuguese couple comes to the information desk to inquire if we have interpreters, and is connected with a volunteer who lived for several years in Brazil. The volunteer helps them to plan their visit and answers their burning questions about the construction of the Eik Sande, the Viking ship hanging overhead. The second grader is drawn over to the Heart Bar by a volunteer’s invitation to touch a real heart. After exploring the differences between the heart of a horse and that of a mouse, he tells the volunteer that his grandfather has to have heart surgery to get a pacemaker. The volunteer brings out several pacemakers for him to touch and they discuss what these marvelous devices do, how they’re inserted, and how it should help the student’s grandfather stay healthy and active for years to come. These personalized experiences are more than just good customer service. 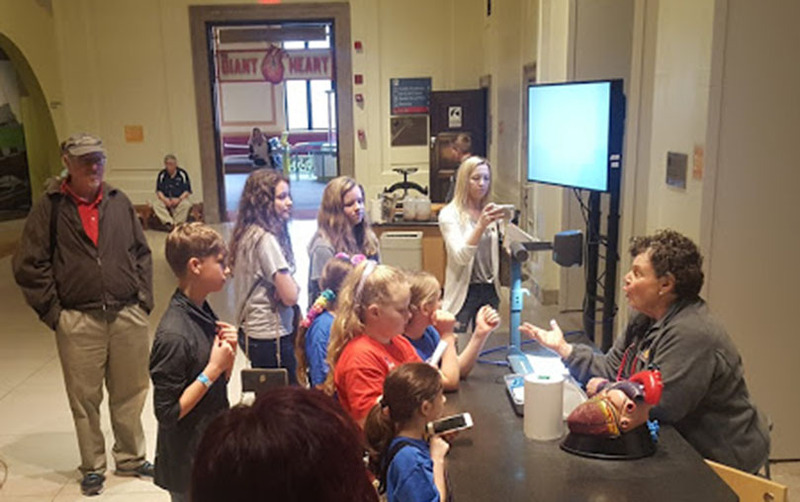 The volunteers are a team with super powers, supporting the mission of the Franklin Institute. 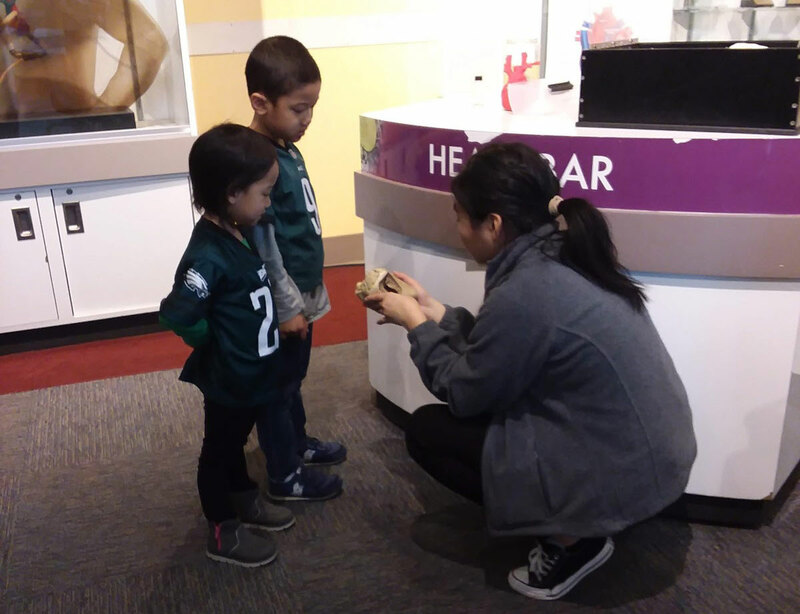 These incredible unpaid heroes are here every day making each guest they encounter feel validated and empowered, and inspiring in our visitors a passion for learning about science and technology.